So, namely an iPhone with iOS 8 and the Instagram app installed. We are basically shooting slo-mo video with the native iOS 8 camera app, then opening it in iMovie app (on phone), editing it (or not), and exporting it as a movie. Then we open Instagram and select that exported movie from our camera roll. Done! This entire process can take about 1-15 minutes, depending on what you are shooting and how involved you are getting with editing the movie. Average time for completion could be 3 minutes. On your iPhone, open the native Camera app and slide the screen to the right or left until you see “SLO-MO” in yellow positioned right above the record button. In the bottom right corner you can now tap on the “FPS” text to change it from 240 frames per second (FPS) to 120 FPS and back again. 240 FPS will make a very slow movie, while 120 FPS will make a slow movie. I won’t get into the math and mechanics of it here. Just try out both to see the results. Shoot a movie for at least 5 seconds (which will end up being about 20 seconds of video recorded at 120 FPS and 40 seconds of video at 240 FPS.) There is a handy timer at the top of the screen, just go beyond the 00:00:05 mark. Assuming the iMovie app is already on your phone (it comes with iOS 8), we now want to get the video you shot into it to edit and export. Saving the movie from your Camera app and uploading to Instagram will simply show the movie running at normal speed. Boo. You have to open it in iMovie then export it to preserve the slow motion frame rate. From the Camera app: While in the Camera app you can preview the movie by tapping on the little square image in the bottom left of the Camera. While viewing the movie, locate the circle icon with the 3 dots in the middle of it (bottom center.) Tap it to see a drawer come up. It is likely empty the first time you open the drawer, so tap the “More” icon to enable iMovie. Now you should see iMovie in the drawer when you tap on the circle icon with the 3 dots in the middle of it. From the Camera Roll: You can also do this by previewing the movie in your camera roll (“Photos” app) and looking for the same circle icon with the 3 dots in the middle of it at the top right. Tap it to see a drawer come up. It is likely empty the first time you open the drawer, so tap the “More” icon to enable iMovie. Now you should see iMovie in the drawer when you tap on the circle icon with the 3 dots in the middle of it. Tapping the iMovie icon while previewing the movie opens it in the iMovie app for editing and preserves the slo-mo frame rate. You should now see “iMovie” at the top of the screen and your movie being previewed. I won’t be getting into the details of how to edit the movie since you can do lots of things to it, and all of that can be figured out or better explained on a dozen other blog posts, like these. What we are mainly after in this step is exporting it so Instagram can show it in slow motion. Your movie is likely way too long for Instagram’s 15-second limit, so let’s cut it down a bit in iMovie. You can do this in Instagram too, but for the sake of this tutorial we are doing it here in iMovie. Tap the scissors icon at the bottom left to bring up the drawer with the clip trimmer. Note the movie length in seconds (XXs) in the top right. Tap and drag one of the yellow handles inward a little to make the movie shorter. When you release it you will see the movie length got shorter. You should also see some of your movie outside the yellow handles got darker. The bright frames in-between the handles is what we are preserving. Everything outside we are cutting. Now, tap the play button (top left) to see the movie clip you are preserving. Don’t worry! Your original movie will remain untouched. We will be exporting (saving) a new shorter movie. 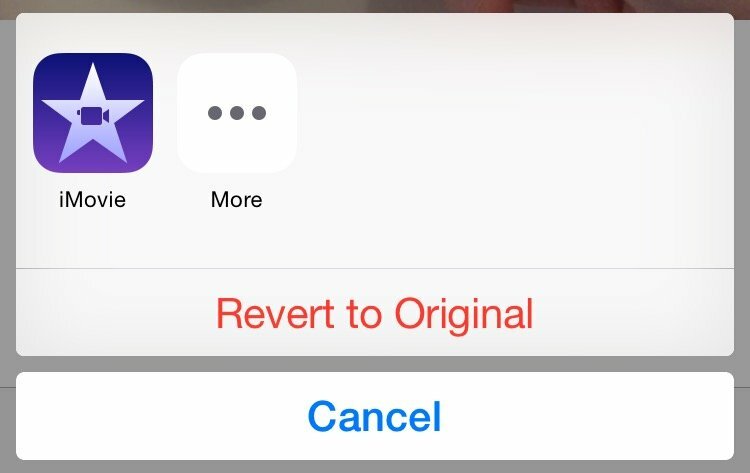 UPDATE: iMovie edits can be reverted back to original. See instructions below. Your task is to move the left and right yellow handles in and out until you get a 15-second (“15s”) clip, and it shows the part you want to post to Instagram. It can take you anywhere from one to a dozen or so tries to get it the way you want. Just keep moving the yellow handles and playing the movie until you get it just right. Once you get a 15-second clip that you like, tap “Done”. The screen should say “Exporting movie” and show a progress bar. After it is done you will be back in the app you started with (Camera or Photos) and your exported movie will be in your Camera roll. Final step! Open Instagram, tap the blue camera icon (bottom center), and then tap the small square image showing a preview of your Camera roll (bottom left.) In here you should see your iMovie export in the last slot (likely the one pre-selected for you), unless you took a video or photo since the step above. Preview the clip to make sure it is in slo-mo and what you intended to upload, then hit “Next” at the top right to post your movie the same way you post any other movie or image to Instagram. Since we already edited the clip down to 15 seconds we don’t have to fool with it here, just post it. And that’s it! You now have an easy in-phone way to shoot slow motion video and post to Instagram using the apps you already have. With the latest iOS update it appears that Apple is saving space by doing non-destructive editing. Meaning, a separate “sidecar” file is created with a .aae file extension, and it is this file that allows you to revert your changes. This is a hidden file in that you won’t see it while viewing photos/videos on the phone, but you can see it when exporting to your computer. Thanks for pointing that out, Dave! Looks like a recent iOS update now uses non-destructive editing to save on storage of two separate videos. I updated the post (see end) to explain this and how to revert your photo/video back to original. I’d like to keep movie clips which I have shortened using the iMovie phone app and delete all the extra footage so it doesn’t take up memory. I used to be able to delete the original movie and now I can’t. I never want to see all the extra data again. How do I get rid of it using just my iPhone? As you may have read at the end of the post, or in the comment above, iOS is now doing non-destructive editing, meaning the original video is still on the phone and a sidecar file simply tells the video player/phone to only show the edited segment. dialog box will come up asking if you want to “Trim Original” or “Save as New Clip”. Choose ‘Save as new’. Thanks very much for the step by step instructions!!! I’ve tried exporting an iMovie video to instagram but have found that the quality of the video is much worse once it’s been posted to Instagram..any fixes? I was pretty shocked at how much worse the quality was as soon as it was posted. Thanks for the help! This is not surprising that Instagram reduces the quality of the videos. Facebook (Instagram’s parent company) and virtually all other online video companies compress the videos so that they are sending over the smallest file size they can get away with. In most cases the video you took with your phone is HUGE, and to send that over the air or even wifi can mean a long wait for the video to load. Instagram, Facebook and others try and find a middle ground between high quality vide and fast loading times. I do think that lately they have moved too far into the fast loading times and sacrificing quality. So, unlike YouTube where you can select what quality you want your videos displayed, Instagram and Facebook will continue to compress it to the smallest filesize they can get away with. As far as I know, there is no way to control the quality output for Instagram at this time.